Brady Olson has a leg up going into his sophomore year of high school. By creating a fictitious presidential candidate out of the classic prank-call mainstay “Deez Nuts,” the 15-year-old has struck viral gold. Beyond Twitter trending and Facebook shares, the made-up candidate is polling at 9 percent in North Carolina, presumably from voters who are either poorly informed, have a great sense of humor, or are really sick of the status quo. One of the best side effects of this phenomenon is that broadcast news has had to cover the phantom candidate. 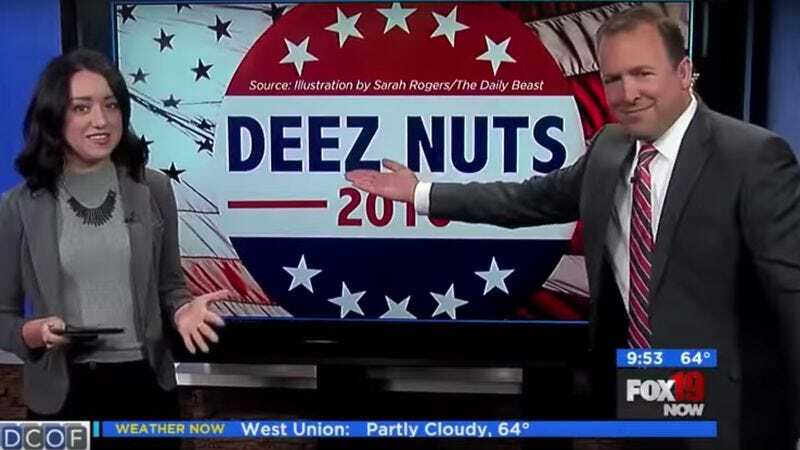 As a result, reporters across the country were forced to say “Deez Nuts” in the process of breaking (and becoming part of) the story. Thanks to Deadspin, there’s now a supercut of professional broadcast journalists uttering the name “Deez Nuts” in rapid-fire succession. Even in the deluge of Nutses, you can make out anchors trying put a distinctive spin on the name. Watch and listen, as Deez Nuts gets hypnotically twisted in alternating tones of sour derision, clueless confusion, professional impartiality, parental concern, and conspiratorial mischief-making.